The award-winning Val de Vie Estate is set to expand following the acquisition of a portion of the farm Kliprug, belonging to neighbouring Pearl Valley Golf & Country Estate. This, combined with the recent purchase of the adjoining Levendal Development from the Power Development Group will make the expanded Val de Vie the benchmark for secure country estate living, as well as provide Val de Vie residents with direct access to Pearl Valley’s renowned Jack Nicklaus Signature Golf Course. Before any celebrations could happen, however, the combined estate needed to ensure that the security offered to residents and visitors was up to the already high standards Val de Vie’s management required. More than simply combining two security infrastructures, Val de Vie’s Danie Bosman explains that a major issue the security team had to deal with was the combining of two mature access control systems that were running independently on each site. This would require confirming and integrating the tagholders (residents, contractors and historical transactions) from each database into a single source of information for the whole estate. In addition to this, although both sites were independently using Impro IXP400 access control systems, which both were happy with, Val de Vie wanted to upgrade to the latest web-based access technology. The decision was made to migrate to the newer Impro Portal Enterprise solution as it allowed for newer capabilities, such as more customisable reports, capturing of tagholder information, and it was primarily web based. The new Portal solution would also allow the estate to use the newer CT50 visitor management scanners from Powell Tronics, which have extra features that the older Dolphin scanners did not have. To get the ball rolling, Val de Vie made use of Thorburn, the estate’s existing security company and Powell Tronics to work with Bosman and develop a solution that would meet the estate’s immediate needs and keep it on par with new technical developments in future. Thorburn was to be responsible for the installation of the hardware, such as the controllers, biometric readers and new access points; while Powell Tronics and Bosman handled the setup of the newer PT Guest visitor management solution and the merging of the database. A project of this size will always have sticking points which cause those in the trenches no small amount of stress. However, Bosman worked closely with the technical and development divisions at Powell Tronics and says “their persistence and assistance were found to be world-class. This project could not have been a success without the assistance of Powell Tronics”. • 29 vehicle entrance and exit lanes to control. • 68 biometric readers installed. • 2500 to 3000 contractors on site daily. • The Val de Vie main gate deals with 27 000 to 30 000 entrances and exits per month (in one lane only). • There are six visitor scanners on site. 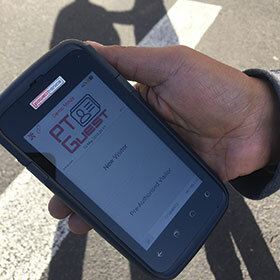 • PT Guest handles between 7000 and 8000 guests per month.